Alabama Shakes are a band who explicitly display their roots and proudly take a slice of the Deep South with them wherever they play in the world. Tonight they may have traded the urban namesakes between their home state and the English Midlands, but there was an unmistakable aura of southern lore around the venue. The challenge is certainly on to find a finer rock n’ soul band on this planet especially one that has successfully permeated the UK mainstream. 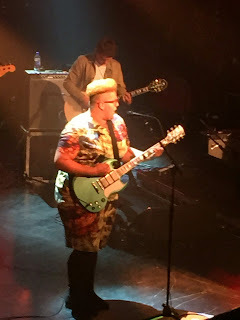 You could quite easily supplant the name Brittany Howard into the band’s title such is the dominant and imposing presence of a front person blessed with a spiritualist talent to deliver the most authentic soul and gospel you are likely to hear in a rock arena. Following a flying visit to the UK, mainly for press purposes, earlier in the year, Alabama Shakes in their eight piece format are now rolling out a series of provincial dates to support their new album SOUND & COLOR, which has already sold in considerable numbers. A few more copies will shift off the shelf after catching the band in full flow and in the true tradition of a major live act, the songs take on a whole new dimension when transported from studio to stage. 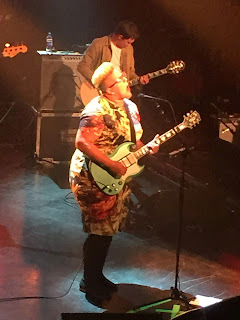 The torrential outpouring of pure emotion into each song is a gasping experience as she blazes through a heady mix of up tempo rock infused songs and others lifted straight from the sermon of Brittany Howard in all their soulful and gospel might. The trio of guitarists including Brittany on a majority of the numbers play a significant part to form the sound, but the cream comes from the keys and organ creating that galactic feel of soul music swirling around in a sumptuous haze. The twin keys approach, a pair of backing singers and the resident drummer provided the final line up pieces that excelled collectively throughout and were fully supportive to Brittany exuding her powerful persona to the nth degree. This was a show of little chat, only a smattering of Brittany’s grateful humility, as the band steamed through an 80 minute set of songs from their two albums to date almost in equal portions. From the debut album BOYS & GIRLS, the band elected to omit the popular tune ‘Hold On’, however this show was more about the entity of the radiated emotion than eulogising over individual songs. However to present some detail ‘I Found You’ and ‘Rise to the Sun’ off this record raised the energy levels, while ‘You Ain’t Alone’ and ‘Be Mine’ were among the most intense numbers. 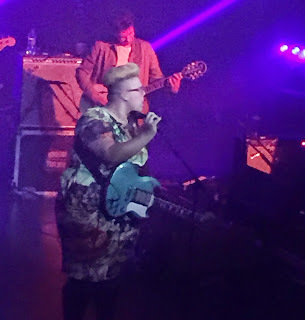 To put the live performance of Alabama Shakes into context, the lead single from the new album was perhaps one of the evening’s lighter moments with Brittany seemingly taking an emotional breather. This is no slur on ‘Don’t Wanna Fight’ which was a good choice to court popular appeal, but it’s dance-like beat and almost disco vibes fall short of Brittany at her incredible soulful pinnacle. ‘Dunes’, another popular track from this album, had an early airing in the set list and in contrast to shows where the final song is a rousing anthem, this evening closed with a more low key effort in ‘Over My Head’ which reflected on the observation that this was a gig with a domineering focal point. Three other notable new songs to feature and worth a mention were 'Miss You', ‘Gimme All Your Love’ and ‘The Greatest’. The evening got off to a blistering start with an exhilarating blast of Mali style blues rock groove. Songhoy Blues are a four piece band bringing the best of African electric rhythm aided by yet another expressive and effervescent front person capable of whipping up a docile crowd. It took barely two songs to hook in the gig early birds which gradually swelled to a sizeable proportion. Orchestrated participation matched the dynamism from the stage and this band are set to be an instant hit when they hit the UK festival circuit this summer. There is going to be a lot more of Alabama Shakes in the UK this summer as well and this exposure will bring the power, guile and brilliance of American roots music to a wider audience. Make no mistake Brittany Howard does not play to a mainstream gallery and more pertinently on stage she sinks into a wonderful mire of transfixing soul, blues and gospel. That extraordinary lung sapping vocal pedigree sends shivers down the spine. While there may be a Brittany Howard in every church and hall in Alabama, there is only one pounding the international rock stage and one who also kills it every time she explodes into action.